ALL the 18 villages that will be affected by the proposed airport at Navi Mumbai boycotted the public hearing held on May 5. The government acquired the land for urban development almost 40 years ago, but until the airport project was planned for the site, villagers did not fear losing it all. “Even after so many decades we have not received any compensation. 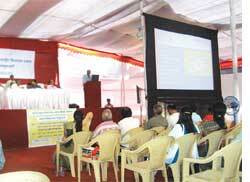 Give us our dues first,” said R C Gharat, president of the association of 18 affected villages. Over 200 villagers marched to the public hearing in Panvel taluka, waved black flags and handed their demands to the district collector. A public hearing is mandatory for clearance from the Union Ministry of Environment and Forests (moef), but the poor public support is unlikely to affect the project as the Centre has issued yet another notification on coastal regulations that makes special note of the Navi Mumbai airport. At the hour-long public hearing, attended by 40 people, villagers raised slogans against the project and refused the mineral water, juice and lunch packets being served by the project promoter cidco (City and Industrial Development Corporation of Maharashtra Ltd). The Rs 9,625 crore Navi Mumbai airport is proposed to be built over 2,054 hectares (ha) in a public-private partnership. cidco aims to complete the first phase of the airport by 2013 and entire project by 2026 (see ‘Green alert in Navi Mumbai’, Down To Earth, April 15, 2009). The site of the new international airport, 60 km from Mumbai, has been embroiled in controversy from the start because it falls under the coastal regulation zone (crz). Construction activities are banned or regulated in such areas (see ‘Fishers at bay’, Down To Earth, December 31, 2008). 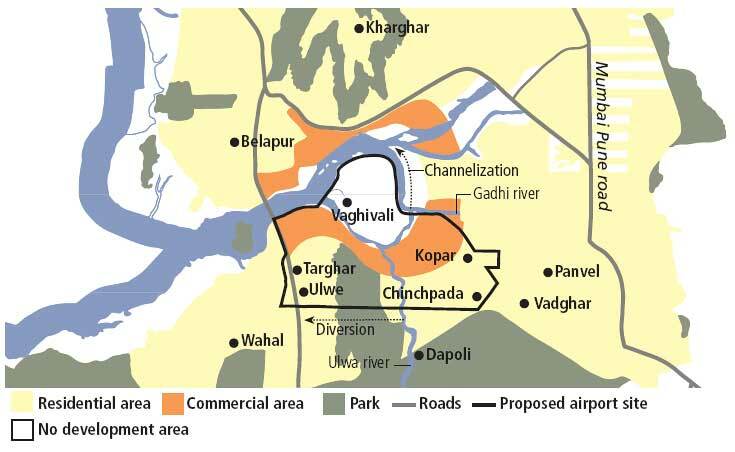 “The proposed site is a low-lying area next to the Panvel creek and has two rivers flowing—Ghadi and Ulwe. Mangroves are spread all across the marshland. Reclaiming such an ecologically fragile area would be disastrous,” said Devkar Ganesh, Navi Mumbai journalist. Maps provided by cidco show the site is covered with water, mudflats and mangroves. But the general manager (sez), cidco, Jayant Kulkarni, had it all worked out. “We would be scientifically diverting the Ulwe river, whereas Ghadi river would be channelized. There would be no flooding and backflow of water,” he assured. Villagers are confident they will stall the project. As per cidco’s rehabilitation package, people whose land was acquired were promised 12.5 per cent of the developed land and jobs. “We lost our agricultural land and have received nothing in return. Worse, we are living in temporary houses,” said a villager. In addition to the rehabilitation imbroglio the airport is also being viewed as an ‘ecological disaster’. According to cidco, 160 ha of mangroves would be razed to the ground to make room for the new airport. cidco has hired us -based L ewis Environmental Services and Gujarat Ecology Commission to plant compensatory mangroves over another 350 ha at Dahanu, about 200 km away. Mangroves act as flood control barriers. “Mangroves cannot be planted anywhere, as they are very locale specific and provide localized benefits. Navi Mumbai’s micro-ecology is very different from that of Dahanu,” Vivek Kulkarni, a Mumbai-based ecologist and mangroves specialist, pointed out. Officially the ball is now in moef’s court. But unofficially, it seems the Navi Mumbai airport has already got the Centre’s green signal when last month the ministry issued a pre-draft Coastal Regulation Zone (crz), 2010. This pre-draft is a new version of crz Notification , 1991, which the ministry is redoing at present. It was no coincidence that this pre-draft made a special mention of allowing the construction of proposed Navi Mumbai airport in crz, albeit on conditions. Our land was acquired almost 40 years ago, but we have not received any compensation till now. “Development of green field airport in Navi Mumbai shall be undertaken subject to detailed scientific study for incorporating adequate environmental safeguard measures required for neutralizing damage to coastal environment…,” reads the notification. Environmentalists claim this clause lets the cat out of the bag. “The public hearing was just a formality. moef is in sync with cidco and the state government. Otherwise why would a central notification name a single specific project,” questioned Vivek Kulkarni. The current pre-draft crz, 2010, has seen many avatars. It evolved out of the recommendations of an expert committee chaired by agriculture scientist M S Swaminathan, and various public consultations held by the environment ministry. The last draft, Coastal Management Zone (cmz) Notification, 2008, received flak not only from the fishing community and ngos, but also from the industry. Under public pressure, the 2008 notification was allowed to lapse and a pre-draft crz, 2010, was issued (see ‘Fishers at bay,’ Dec 31, 2008). This pre-draft is open for comments till May 30, after which a proper draft notification would be issued. Experts already see loopholes in the new document. The crz, 2010, reclassifies coastal zones in five groups: crz -I (ecologically sensitive areas), crz -II (built up municipal areas), crz -III (rural areas), crz -IV (aquatic area) and crz -V (areas requiring special consideration). Both the South Indian Federation of Fishermen Societies (siffs) and the National Fishworkers’ Forum (nff) have organized a two-day meeting (May 13-14) in Chennai to discuss the pre-draft. “We fear that during reclassification, crz-I areas needing maximum protection may get converted into crz -II and crz -III. For instance, disappearance of mangroves may convert a crz -I area into crz -II. 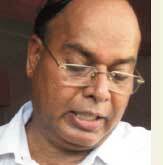 At highest risk would be Mumbai and Navi Mumbai,” said V Vivekanandan, advisor to siffs. He is also worried about the “special consideration” the pre-draft, crz, 2010, accords Mumbai, Navi Mumbai, Goa, Kerala and the Sunderbans “in light of certain special circumstances”. This will open the floodgates, believes Vivekanandan. “Tomorrow Chennai or Kolkata can demand an airport in crz -I. On what grounds will the ministry refuse them?” he asked. Fishing leaders question the need for redoing of coastal management zone plans. These plans were prepared way back in 1996 and have been approved both by the Centre and the Supreme Court of India. The pre-draft talks of providing benefits to the local people and not just fishers. “This means, anyone can buy land in a local panchayat on Kerala coast and become a coastal community and exploit the coast for all purposes, including tourism,” he added. According to T Peter, president of Kerala Independent Fish Workers Federation, “Almost 80 per cent of the Alleppey coast has been taken over by tourism and by the sand mining mafia. In Gujarat, shipbreaking, industry and ports have displaced fishers,” said Peter. “We don’t want a notification; it can be modified any time. We want Parliament to pass the crz Bill,” he added.